There's always something to learn at Abney Park. You can teach yourself about veteran trees by following our veteran tree trail or learn snatches of history from our thousands of monuments, some of which are snapshots of personal, national and international tragedy and drama. For more interactive learning, take a course in stonecarving or 'bodging' - woodworking with hand tools, the old fashioned way. During school holidays, kids can learn all about bugs, bushcraft and environmental art at our Forest School. Abney's green woodworkers aim to introduce people to a rewarding and therapeutic activity, connected to a long tradition of craft. Working outside and using wood felled locally and in the cemetery, they bring heritage crafts into the heart of the city and make basic woodcraft skills available to all. At their outdoor workshops people of all levels of experience make crafts alongside one another using hand tools and green wood straight from the log. They teach families and adults through one day and longer term courses. Members of London Green Wood can make use of the workshop every week with tools and wood provided, to join the workshop sign up for an Introduction to Green Woodwork course which will give you all the skills you need to return to use the workshop. For more information see London Green Wood’s website. 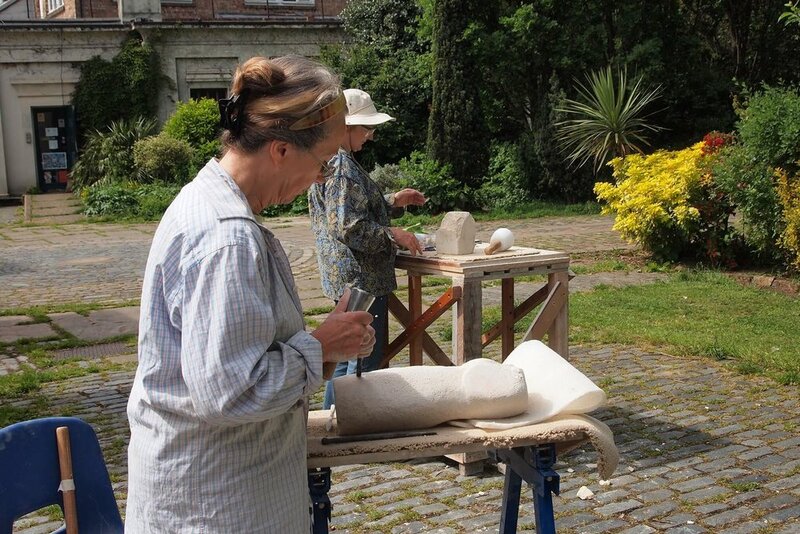 Abney Park Carving Group is a collective of creative individuals, from a variety of backgrounds, all with a shared interest in making their mark in stone. For more information on the courses they offer please see the Abney Park Carving Groups’s Facebook page. In The Sticks runs Forest School schools at Abney Park during half-terms and school holidays. We will explore the wonders of the forest, build dens, go on nature walks, make natural art and craft, play some fun woodland games, plus a lot more. For children aged 6-11 years old.Cost: £40/day or £190/week (Mon-Fri) per child. Email info@inthesticks.org.uk for info and dates of the next Forest School and to book. Places fill fast! Children need to bring a packed lunch and wear warm, waterproof clothes and shoes. We occasionally run courses in woodland management, learning about such topics as controlling invasive species and pruning for safe and healthy growth. Keep checking our news and events pages for more information or sign up to our mailing list here.